Click here to answer a couple of questions! Think about: settings (require email address, edit confirmation message etc), types of questions to get USEFUL answers, adding image prompts, using linear scales, response validation, or even getting people to upload files! Google Sheets is a great way to analyse data - and (I think!) it's much more user friendly than Excel :). Click here, go to 'file' 'make a copy' to experiment! The strength of Google comes in its ability to enable collaboration. Working 'live' on a document is VERY powerful... Everyone has a voice! These products are easy to use, accessible from most devices. Please note that all of these products need a gmail/google account - click here to sign up for one right now! Transfer to Google Doc if it gets too big! 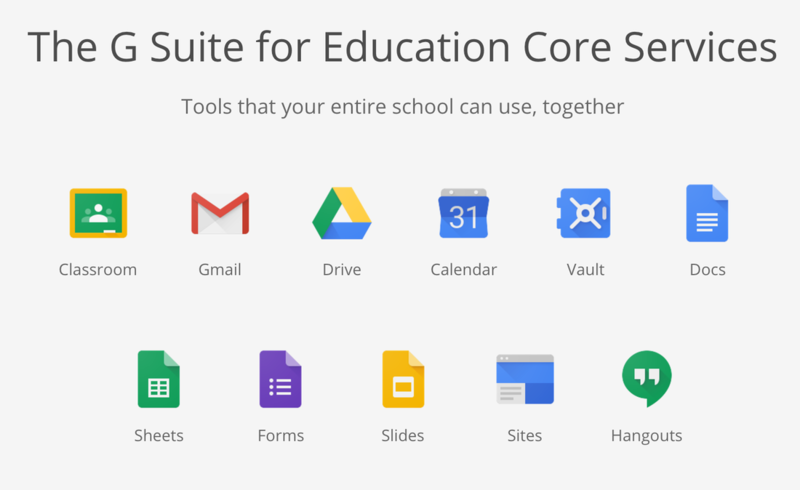 Sign up for GSuite for your school for free! Email me for follow-up help/support!